The Region of San Martin has been participating in the REDD+ SES Initiative since 2012. The pilot of the use of REDD+ SES in San Martin aims at providing inputs and experiences for the development of a Safeguards Information System led by the Ministry of Environment (MINAM) at national level. A multi-stakeholder safeguards committee composed of government, civil society, Indigenous Peoples and private sector was established by decree of the GORESAM in November 2014 to oversee the development of SIS and other safeguards related issues in the region. The committee will be installed and hold its first meeting in 2015 and will receive capacity building by the facilitation team and REDD+ SES Secretariat. The establishment of the safeguards committee is the result of discussions with the ‘Social Group’of the San Martin Regional REDD roundtable, an open and transparent dialogue platform for REDD+ issues chaired by the Regional Government with the participation of civil society organizations. In May 2013, a Technical Advisory Group was created to provide technical support to the government of the GORESAM for the development of SIS and use of REDD+ SES. It is composed of the Center for Conservation, Research and Management of natural areas (CIMA), Peruvian Society for Environmental Law (SPDA) and Center for Indigenous Peoples' Cultures of Peru (Chirapaq). The group has met regularly to discuss and provide inputs on the establishment of a multi-stakeholder committee overseeing the implementation of safeguards and developing a methodology and process for drafting indicators. The use of REDD+ SES in San Martin is facilitated by the Regional Environmental Authority (ARA) of the Regional Government of San Martin (GORESAM) and Conservation International Peru. As a prior step to development of SIS in San Martin, capacity building activities have been carried out to strengthen stakeholder’s knowledge on REDD+ safeguards. Since 2012, a series of capacity building workshops and meetings were held with members of the Social Group of the Regional REDD Roundtable of San Martin, representatives of the Ministry of Environment and other civil society organizations to raise awareness and strengthen capacities on REDD+ safeguards. These workshops and meetings provided the opportunity to raise awareness on REDD+ safeguards and to discuss the steps for the establishment of the Safeguards Committee in San Martin. 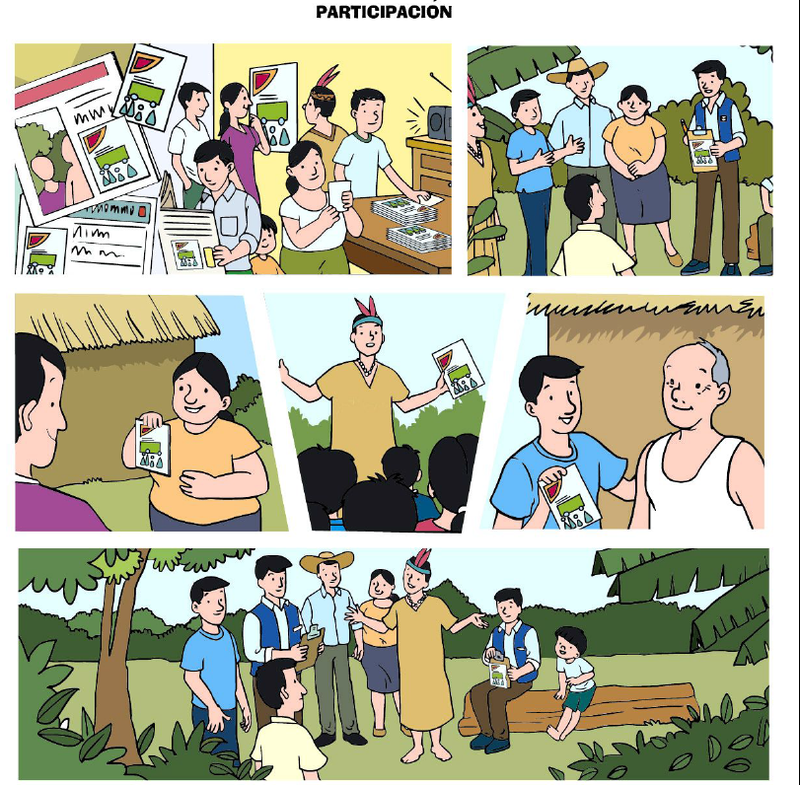 The facilitate the dissemination of information to stakeholders, a leaflet on REDD+ safeguards was developed by the facilitation in close colaboration with MINAM. In 2013, the facilitation team developed a series of posters on REDD+ safeguards of particular importance to Indigenous Peoples as well as a short animated video on REDD+ safeguards. These materials help to facilitate the understanding of REDD+ safeguards and strengthen capacities of Indigenous Peoples and local communities so that they can fully engage in the process. These materials will be used for capacity building meetings and workshops in San Martin as well as in other regions of the country. A first national workshop to raise awareness on REDD+ safeguards was held by MINAM in Lima in March 2012 in which participated over a hundred representatives from Indigenous Peoples, civil society, regional governments, local governments of the various regions of the Amazon of Peru. A regional exchange workshop on Safeguards Information Systems was organized by MINAM with support from USAID ICAA, Conservation International Peru, the REDD+ SES Initiative and UN-REDD Ecuador in October 2013. The workshop brought together 45 representatives from government and civil society from Peru, Ecuador, Chile, Mexico, Honduras, Paraguay and the State of Acre in Brazil to exchange on experiences to develop safeguards information systems. The workshop report is available here. A workshop on implementing REDD+ environmental safeguards in the Andean Amazon was organized by MINAM, Forest Carbon Market and Communities and USAID ICAA in November 2014. The workshop brought together 31 representatives from government, academia and civil society, including the Coordinating Body of Indigenous Organizations in the Amazon River Basin (Coordinadora de las Organizaciones Indígenas de la Cuenca Amazónica, COICA), UNDP, the World Bank, the Peruvian Ministry of Culture and the Confederation of Amazon Nationalities of Peru (Confederación de Nacionalidades Amazónicas del Perú, CONAP) and the REDD+ SES Initiative to learn and exchange experiences and recommendations on the implementation of environmental safeguards for REDD+. The report is available here. In March 2015, a capacity building workshop with representatives from government, civil society, regional governments and Indigenous Peoples was hold to strenghen the capacities of stakeholders on REDD+ safeguards so that they can fully engage in the process for developing Peru national Safeguards Information System. The workshop also provided the opportunity to learn about Indigenous Peoples' approach to safeguards for Amazon Indigneous REDD (REDD Indigena Amazonico). The workshop report is available here. In 2014, a kit to support stakeholder participation in the drafting of indicators to provide information on how REDD+ safeguards are addressed and respected was developed. The kit sets out a methodology for adapting indicators to the local context and includes a training module on indicators along with guidelines for facilitators to provide the training, a glossary and guidelines to build capacity on safeguards and REDD+. The kit was tested and approved by the Government of San Martin, members of the San Martin REDD+ Roundtable and Indigenous Peoples. The kit will be used to develop indicators at regional level to provide information on safeguards if needed or to as a supporting tool to develop indicators as needed at national level.